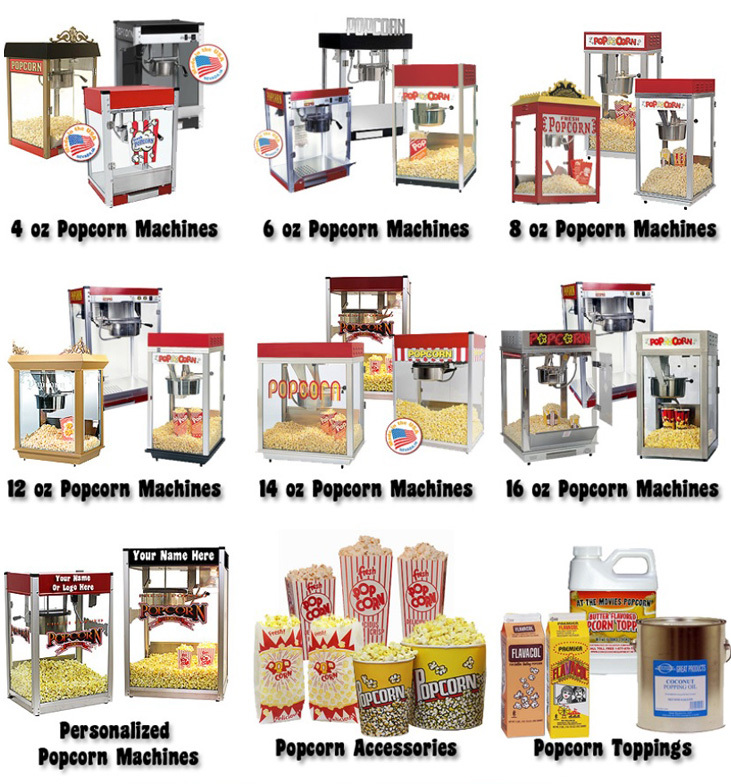 Top selection of popcorn machines, poppers, commercial machines & supplies from top manufacturers Perfect for residential, schools, churches, conession stands, and stadiums. Whatever you need in the way of popcorn machine supplies like bulk corn, popcorn bags and boxes, kettle cleaners or accessories, you'll find it all right here in our online catalog. Looking to buy a popcorn machine? Our selection includes residential size poppers on up to commerical popcorn machines. The extensive popcorn supply section includes popcorn, oils, buttery topping, portion popcorn packs, bags, boxes, & popcorn scoops. Do you love popcorn? Enjoy our extensive online catalog of world class popcorn machines, accessories and popcorn making supplies. Whether you want to whip up a family-sized batch of hot popped popcorn or wish to produce hundreds of bags of concession stand popcorn, we've got everything you need, many popcorn machines in stock and ready to ship.